Ceremonial scissors display cases help you preserve the memories of your successful launch. After all, a grand opening is all about showcasing your fruitful endeavors and hopeful future; a shadow box style display case is the ideal mounting frame to show off the ribbon cutting scissors that you used to perform this special ceremony. After a grand opening ceremony, the scissors and even the ribbon used become keepsakes that you will want to proudly show off. Shadow boxes are the adequate type of display case since they keep the scissors untouched in their shrine but allow full visibility of the actual scissors and any type of engraving or personalization you added. 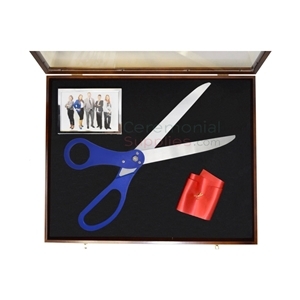 At CeremonialSupplies.com, you will find beautifully crafted shadow boxes and display cases for your ceremonial scissors and keepsakes from your ribbon cutting ceremony. Preserve the memories of the beginning of your journey to success. Aside from the ribbon cutting scissors there may other mementos you can present in ceremonial display cases. Some of our displays are large enough to fit other materials that you may have used for the ceremony. You may have passed out ribbon lapel pins to your audience as keepsakes or you may have been featured in a local newspaper story. These make excellent examples of items you could show off in your ceremonial scissors display case along with the actual scissors used. Who’s to say that a framed photo of the ribbon cutting event could not be placed within the display frame? You may even want to save a piece of the ribbon used in the ceremony to save along with the rest of the memorabilia of your grand opening. It is recommended that display cases for ceremonial scissors are placed in a conspicuous area of your business or office where the public is able to see it. The whole point of the celebration is to immortalize the beginning of your business with a special ceremony. You probably invited the most important people that could come to mind at the time, but there will be others that you will meet in the future that you may still impress with memories of your event. Only serious businesses with high standards hold ribbon cuttings, so it is inevitable that you will draw some positive attention. You may find that a ceremonial scissors display case looks best mounted on a wall, but you may also lay it flat within a large museum style display case along with other important articles. Ceremonial ribbon cuttings are as important to businesses as weddings are to loving couples. At CeremonialSupplies.com, we want you to commemorate your big day in a special way. Choose from our various wooden display cases and shadow boxes that will frame a symbol of your success. 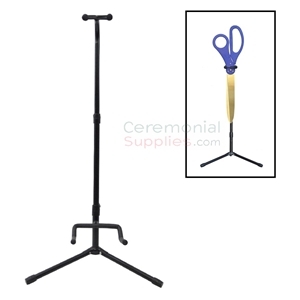 Contact us for more information on our ceremonial scissors displays and corresponding supplies for your grand opening ceremony.